Since its origins as a student dance club on the Stanford University campus, the Stanford International Folk Dance group has been a place to enjoy and learn recreational dances of the world in a delightful social environment. We meet for dancing once weekly on Fridays except on some holiday weekends. Adults, teens, and families are welcome. Stanford International Folk Dancers is a not-for-profit group staffed by volunteers. Your admission donation at the door pays entirely for operation costs as well as a small compensation for volunteer instructors. For live music nights or special workshops the admission price also reasonably compensates the talented band or instructor. As of August 11, 2017 we are not meeting at First Baptist in Palo Alto. Except for occasional evenings in when we meet at All Saints Episcopal Church in Palo Alto, we will be meeting at Bethany Lutheran Church in Menlo Park. Unfortunately this venue is not available on the second Friday of each month. At this time we’ve chosen not to meet on those evenings instead of seeking an alternative venue. Our upcoming featured instructor nights include Katherine Abbott April 12, Lew Smith and Melissa Miller on May 10 and 17, and Jerry Duke on June 14 and 21. Coming on April 5 Balkanton 340 returns for a live music dance party. On June 7 join us for a French dance workshop facilitated by Gary Breitbard and Jena Rauti with live music by the Fête Musette Ensemble. Join us also for live music by Zabava International! on May 3. We will not meet April 19 or May 24. 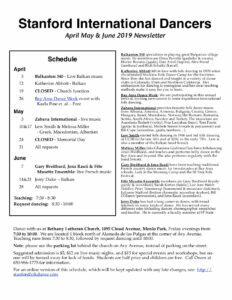 All evenings through June will be at Bethany Lutheran in Menlo Park. Obtain a PDF copy of our April to June 2019 schedule. For the comfort and safety of our members, we reserve the right to refuse admission to anyone. Dance with us Friday evenings from 7:30pm. Please check event listings for location and time. General admission is $5, $12 on live music nights, and $15 for special events and workshops. Students are half price and children are free. No one will be turned away for lack of funds. Call Owen at 650-966-1775 for more information. Or e-mail us.